Citrix Receiver for Windows 10 is now available at Windows Store. 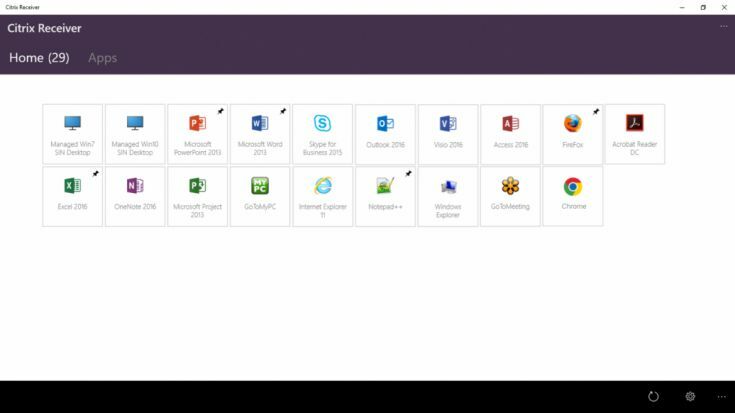 The new UWP app from Citrix gives access to Windows and Linux virtual applications and desktops, anywhere, from any device. That means users can run legacy apps like Google Chrome, Firefox and others through it desktop virtualization technology. Windows 10 S is a locked-down OS that runs the applications delivered from Windows Store only. This means many existing Win32 apps, which are not moved to the store yet, will not run locally on Windows 10 S. The best way to get access to these business critical Win 32 apps is through Citrix XenApp and XenDesktop. Citrix Receiver opens the door for the Win 32 apps to run on Windows 10 S.
This way you can run your business critical apps and also get the flexibility to run any other browser like Chrome or another search engine on browser like Google search, adding more value on top of the simple, secure, cost-effective characteristics of Windows 10 S.
Citrix Receiver compatible with Windows 10 S is built using ‘Universal Windows Platform (UWP)’ technology and it is delivered from the Microsoft Store to the users. Universal Windows Platform architecture enables the app to run on all Windows 10 platforms, which means Citrix Receiver can now run on devices like Windows 10 Phone, PC, Surface Pro, IoT Enterprise, IoT Core, Surface Hub and even the HoloLens. Get the app from the Windows Store or from the link below.